Another hot day, another evening of kitchen avoidance. 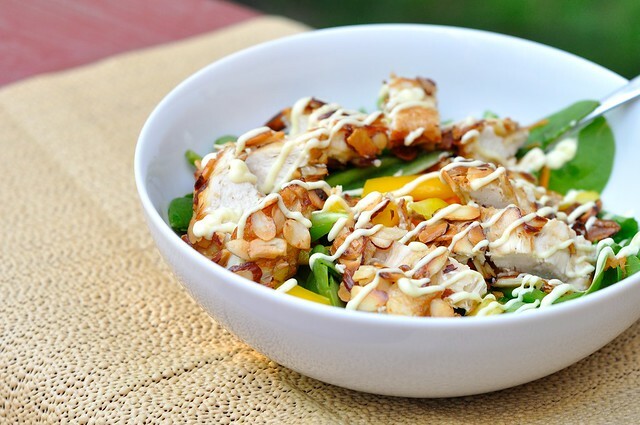 With leftover goodies from our Sesame Chicken Lettuce Wraps, we threw together a light and creamy salad of almond-crusted chicken and honey mustard dressing. Although a little messy to prepare, it is super easy to make and another meal we can easily put together in less than 15 minutes. Who doesn’t love a big salad? 1. 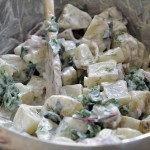 To make Dressing: In a small bowl, whisk together the mayonnaise, mustard, honey, and lemon juice. Store covered in the refrigerator until ready to use. 2. Trim fat from chicken breasts and slice into four 4 pieces. With a kitchen mallet or your fists, pound each piece to an even ¼ to ½-inch thick. 3. In a bowl, combine salt, liquid aminos, 2 tablespoons of the corn starch, white wine, baking soda and 2 tablespoons of lemon juice. Add chicken and stir to coat completely. Allow to sit for 3-5 minutes. Transfer chicken to a plate. In the same bowl, beat two eggs and slowly add the remaining 3 tablespoons of cornstarch. This will keep the corn starch from clumping. Add chicken to coat. 4. In a 12-inch frying pan, heat ½-inch (it might take less) oil over medium-high heat. Spread almonds (and brown sugar should you choose) onto a clean, flat surface (counter or cutting board will suffice). 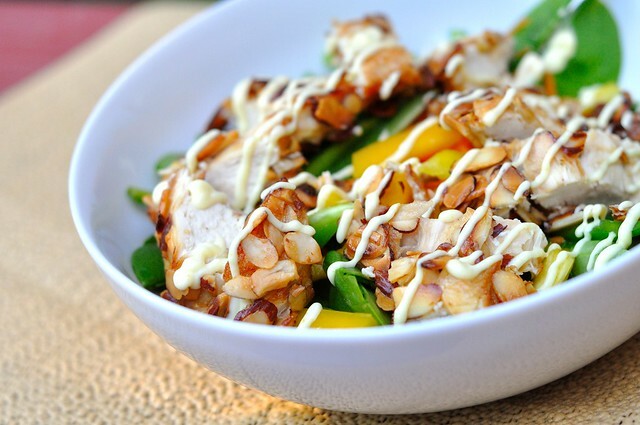 Press chicken into nuts/mixture, coating both sides evenly, then carefully lay chicken in oil. Cook until browned, turning once, 2-4 minutes total (cooking time will vary). Drain on paper towels. 5. 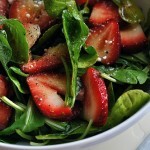 Slice and toss with spinach and honey mustard dressing to taste, adding about 1 tablespoon at a time. Sprinkle with freshly ground pepper and serve immediately. it’s so fast and easy Rach, you’ll love it! Mmmmm, big salad like this is the best!!! We invested in some large bowls from Crate and Barrel, so definitely no more wimpy salads for us! that sounds amazing! 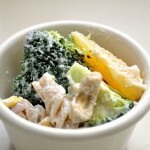 the dressing is what caught my eye on foodgawker, but that chicken preparation sounds delicious! 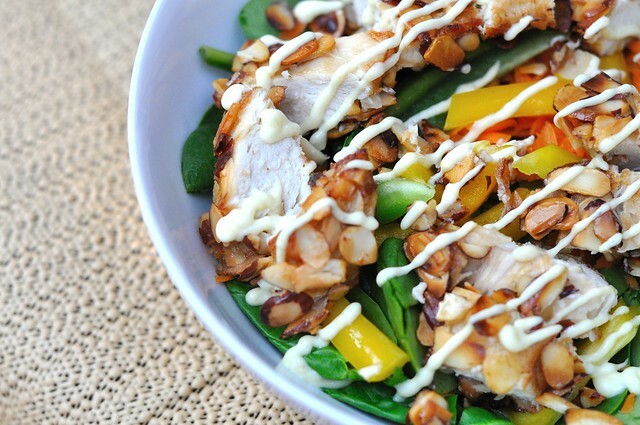 It’s super easy and because it’s not heavily fried, is a lighter option to a traditional fried/crispy chicken salad. Hope you like it! Wow – this was fantastic! However, I think the instructions are confusing. I’m assuming it should read at the end of step 3 to dredge the chicken in the egg. Then step 4 should read to coat the strips in the nut mixture BEFORE adding to the oil in the pan. The dressing was the BEST!! 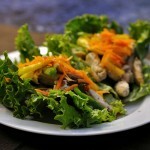 Thanks for a great salad recipe – can’t get enough of those:). Yes that is correct. Sorry for not being clearer, I tend to write pretty fast and make assumptions as to how much direction is needed. 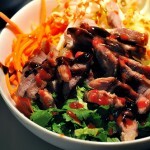 Glad you loved the salad, it’s definitely one of our new favorites!